Out in the bitter cold air, Daniel Palmer waves his crumpled cardboard sign — “homeless anything helps” — at people and cars passing by. Every day the 34-year-old stands here, at the intersection of South LaSalle Street and West Congress Parkway, patiently panhandling for hours. This is his “spot,” he says. It’s not only about the busy traffic flow. From here, he can easily take a five-minute walk to the Harold Washington Library, where he goes to stay warm if it “gets too cold” in the wind, to read the newspaper, and check on the weather forecast, like many other homeless people. Public libraries welcome everybody, no matter how much or little they have. But as more people in need such as Palmer turn to public libraries for warmth and safety, Chicago and area suburbs are leading the way in a growing trend where public libraries respond to the needs of the homeless by including social workers on staff to offer professional assistance. The Addison Public Library hired its first social worker in 2015 and the Oak Park Public Library kicked off its social service program in 2016. 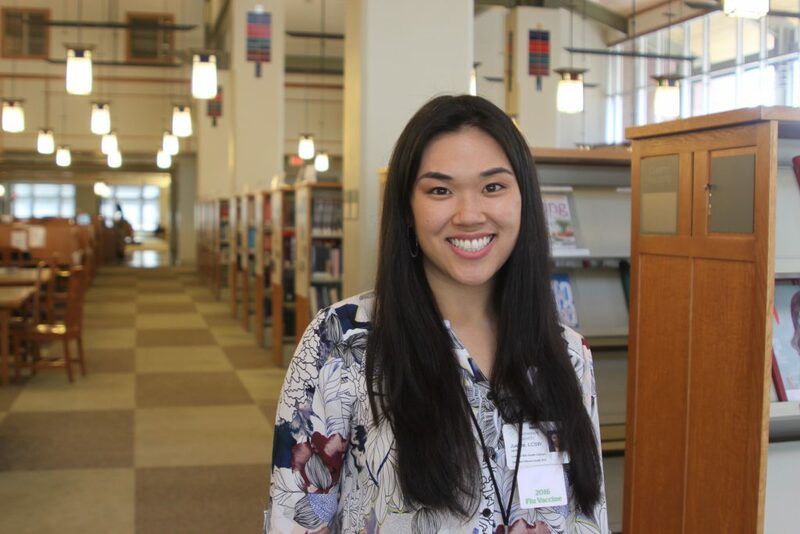 The Evanston Public Library hired one social worker in 2017. In September 2018, two Uptown branches of the Chicago Public Library collectively welcomed their first full-time social worker, Justine Janis, who splits time between the Bezazian branch and the Uptown branch. And many more social workers are expected to join library staffs. As an outgrowth of their long-standing mission of providing information to people, libraries are working hard to listen to the local concerns and tailor their programs to meet specific needs of their communities, including the homeless. “We hear a lot from vulnerable patrons, especially people experiencing homelessness, that the library is their sanctuary,” says Robert Simmons, who works as the director of social services and safety at the Oak Park Public Library. A 2016 report by the Oak Park Homelessness Coalition shows that 2,182 people were estimated to be homeless in west suburban Cook County, which includes Oak Park. When local shelters are closed, often during daytime hours, large groups of homeless individuals and families flock to the Oak Park library system, seeking free spaces such as study rooms where they can stay for a long time, bathrooms and also computers where they can connect to the internet to keep in touch with friends and families. That’s critical since 42 percent of homeless people don’t currently have a smartphone and over a third don’t have access to the internet after losing their homes, according to a 2017 study by the University of Southern California. First inspired by a joint workshop with the Harwood Public Innovators Lab, the Oak Park Public Library hired Robert Simmons as its first full-time social worker in March 2016 and later developed a safety and security team, all trained with mental health first aid, to serve patrons with special needs, a majority of whom are homeless. Since 2016, Simmons and his team have helped 297 homeless individuals to find public housing and job opportunities. Some 96 percent of them are experiencing disorders that include mental illness and substance abuse. The team regularly organizes outreach to Oak Park’s three library branches to identify patrons in need. Librarians make referrals and the number of walk-in and call-in patrons has increased significantly within the past year. Immigrants also rely on the social services offered at libraries. In the Addison Public Library, serving a suburb where more than 42 percent of the community’s population are Hispanic and about 35 percent of local residents speak Spanish as their primary language, social services coordinator Lily De La Cruz says her bilingual capacity is crucial to her job. Patrons, especially immigrants who are new to the country, come to the library to seek assistance with enrolling kids in schools, applying for Medicaid and Medicare online, and seeing doctors. Unlike many other social workers, De La Cruz says she decides to work several evenings during the week and stays in the library on some Saturdays and Sundays to “make it easier for people to just stop by the library” and to serve patrons who often get off work late and may have only one day off on the weekend. Offering such hours helps fill the gap left by traditional community caregivers, such as non-profits, who tend to be closed at night and on weekends. Currently, most of the social services provided in libraries are referral-based. In other words, social workers don’t directly offer help to their patrons but help them connect with relevant community organizations after listening to and understanding their needs. Oak Park Public Library, says Simmons, is in collaboration with over 45 organizations in the Chicagoland area. Networking and building community relationships is an inherent part of library social workers’ jobs, says social worker Justine Janis, who joined the Evanston Public Library in February 2017 with a master’s degree in social work from Washington University in St. Louis. She later transferred to the Chicago Public Library in September 2018. Legwork – knocking on doors and sending out business cards – helps library social workers know what’s available in the community. “I try to practice what I preach at the very least,” says Christina Mendez, a social worker at Evanston Public Library since September 2018. In addition to referring patrons to outside organizations, library social workers have tried to invite community providers into the library space. Janis says the goal is to create a “warm handoff” for patrons. “To get into a new office, meet a new person and tell a personal story can be hard for some patrons,” Janis says. “It can be an anxiety-provoking experience.” Offering social services and programs at a library which is already a familiar space “helps get the ball rolling.” The slow process fits the principle of social work – “meet the client where they are,” Janis says. Janis says she has asked Thresholds and Heartland Housing, not-for-profits that provide emergency housing, to set up outreach hours at the two Uptown branches of the Chicago Public Library. Meanwhile, evaluating the outcome of referrals is a challenge that library social workers are trying to meet through different methods. At Oak Park Public Library, social workers follow up with 69 percent of those referred to a community organization, Simmons says. These people are frequent users of the library. But for those who never come back, it can be hard to track results. At the Chicago Public Library, Janis initiated a social work survey two months ago to evaluate the referral process; the results have not yet been released. In most cases, library social workers cannot directly follow up with community organizations for privacy concerns, Mendez says. As of June 2018, about 30 public libraries in the United State had full-time social workers. Public libraries in other areas are eager to learn from the experience of Chicago area libraries. “We get a lot of emails and calls from people across the country to see what we are doing,” Mendez says. Nicole Suhm, a candidate for master’s degree in social work at the University of Illinois at Chicago, will work as a full-time social worker at the Frankfort Public Library after graduation. She says the library’s director and librarians became incredibly interested in the idea of library social work at the last American Library Association conference. The model, says Nicole, can ease the heavy burden on librarians. “Having a social worker who is trained in this work and has experience in hearing traumatic stories helps relieve some burden as well as giving patrons someone who is familiar with the social service system,” she says. In academia, library social work is considered a new way to address social problems. In the digital era, libraries are changing and shifting their focus, responding to the needs of their communities. In the newly opened West Loop branch of the Chicago Public Library, people can enjoy flexible workspaces, a recording studio, early childhood play area, and a digital lab featuring coding and design software. Library social work is an important part of the library’s transformation. “To me, libraries are becoming more community-center-based,” Janis says.